Modern kitchens are the warmest, busiest and most comfortable interiors in our houses. Colorful kitchen decor delights and invites to enjoy a pleasant atmosphere, delicious food and drinks. Artistic touches and creative crafts allow to add personality, texture and bright colors to modern kitchens turning them into intimate and welcoming home interiors. Decor4all presents an amazing art and craft project by London Jumpers and Jazz Festival artists, who transformed a small kitchen interior into a bright, colorful, unique and magical room. 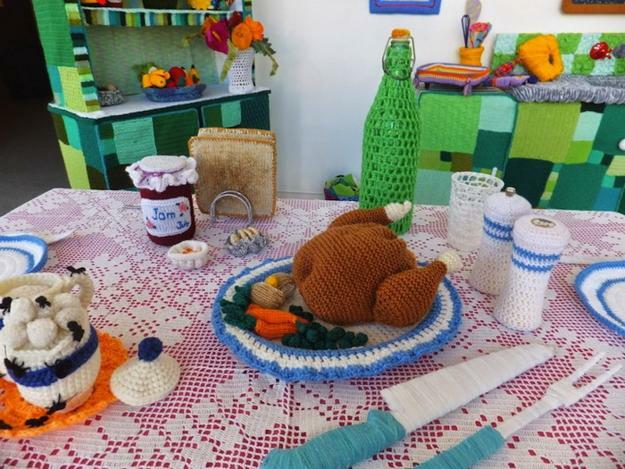 Colorful crochet designs which create kitchen decor items look fabulous, vivid and original. 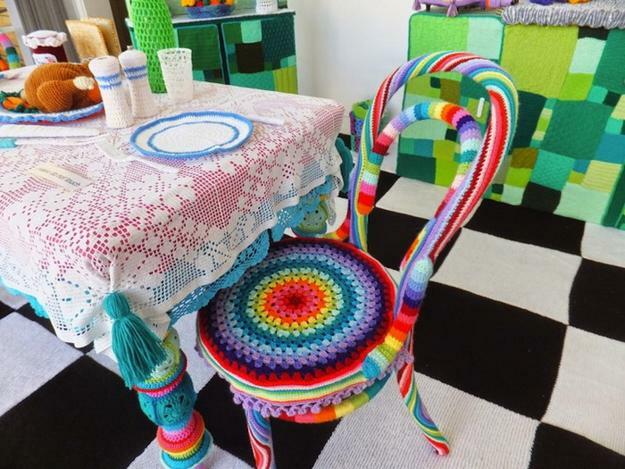 Kitchen table and chairs, dishes and small decorations, a window on the wall and all decorative accents are crochet designs created with colorful yarns. Fifty artists worked at this kitchen decor ideas and made unique decorations with crochet designs. It took seven months to envision these bold, unusual and impressive decorating ideas and create handmade kitchen decor with every detail looking so realistic. The kitchen table is set for a party. 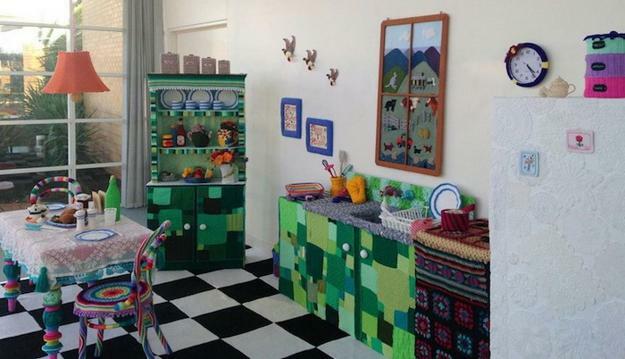 The kitchen sink, stove, refrigerator and every wall are adorned with fabulous crochet designs. Everything, from salt and pepper shakers to lamp shades and telephone in retro style decorated with colorful yarns and gorgeous crochet designs. Very bright and inspiring, this kitchen decor ideas give great craft ideas for home decorating and making unique gifts. The kitchen decor in eclectic style and bright colors can look stunning and cheerful. Even small home decorations and crochet crafts can give any kitchen interior that wonderful, original and interesting look. 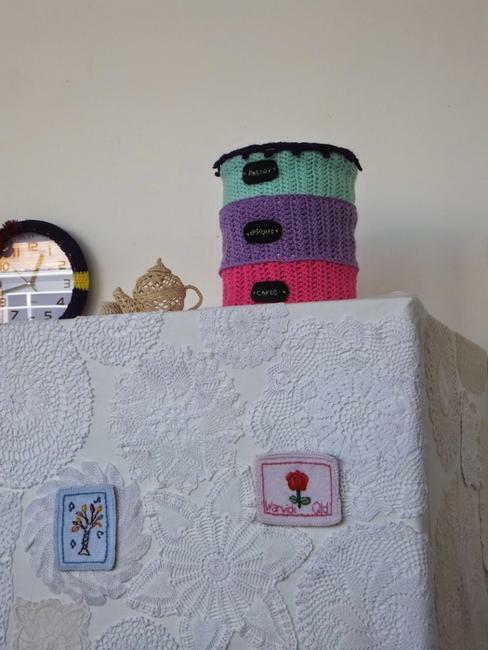 Crochet designs make great wall decorations and fridge magnets. 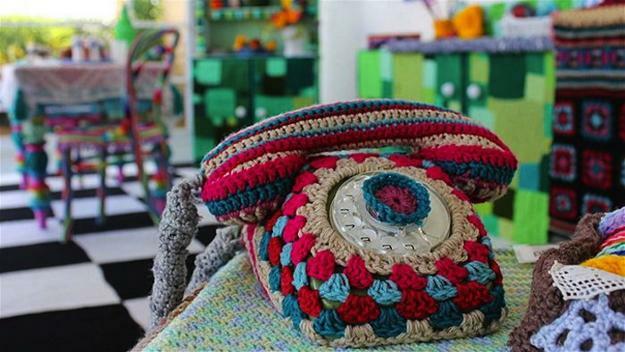 Crochet designs can transform shelves and chairs adding colorful details to kitchen furniture. The artistic craft project was presented in Warwick Art Gallery, the UK. 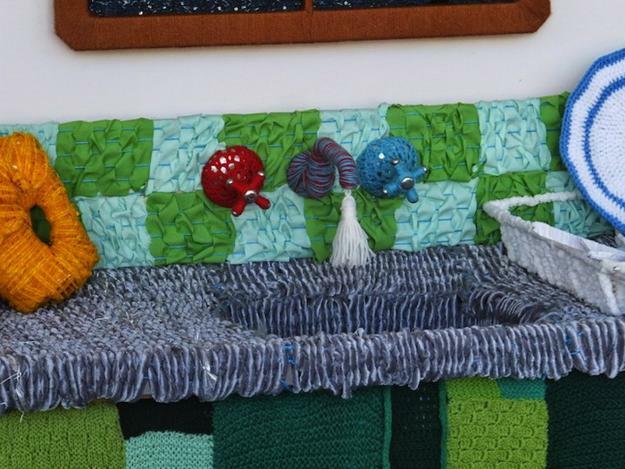 Knitting and crocheting are popular crafts that can be used not only for making clothes and accessories, but for kitchen decorating and making unique gifts.